Holle Organic Pear, Apple & Blueberries.. Suitable for replacing or in addition to breast milk. Suitable for feeding in a bottle but also for preparing Holle Wholegrain Porridges. Easy to digest, gluten-free, no added sugar, with Demeter milk. Around the age of six months, your baby will probably start weaning. But milk will still be their main drink and a key source of nourishment. 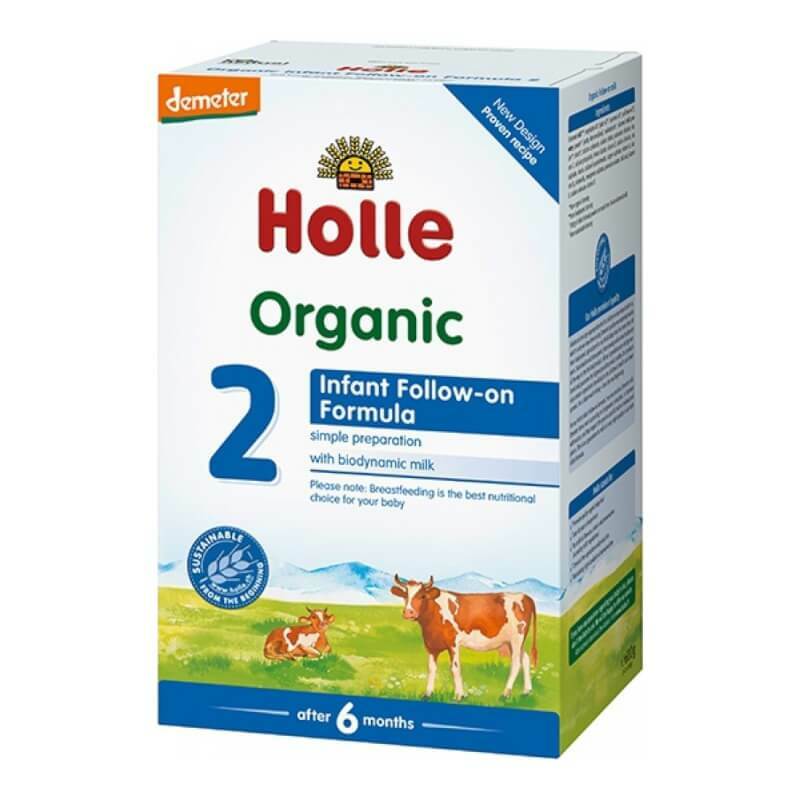 If you care about food quality, you want to choose the healthiest, most natural follow-on milk you can and that's Holle Organic infant Follow-on Formula 2. At this crucial time, your baby needs additional nutrition to support their growth and a more active lifestyle. If her hunger can't be satisfied with Holle Infant Formula 1, Holle Formula 2 Follow-on Milk can be used from six months to one year, either in combination with breast milk or as part of a mixed weaning diet. Holle Infant Follow-on Formula 2 is 100% free from gluten, wheat, soya and has no added sugar, fish oil and GM ingredients. For your baby's healthy development, none of the Holle baby milks have added fluoride. It's easy for your baby to digest - and it tastes great! Preparation is quick and easy too. Holle Organic Infant Follow-on Formula 2 is produced from 99% organic ingredients plus vitamins and minerals (which are required by law). Holle only sources from local farms, so all the milk used comes from a trusted, known origin. Each farm raises its cows in a natural, caring environment where they are free to graze in organic fields cultivated according to modern biodynamic principles - in tune with nature and completely without chemicals. And because Holle Formula 2 is made with such high-quality milk, its nutritional value is unbeatable. Suitable for baby from 6 months old. Skimmed milk** (Germany), vegetable oils* (palm oil*, rapeseed oil*, sunflower oil*), whey powder* (partly demineralized), maltodextrin*, skimmed milk powder**, starch*, calcium carbonate, sodium citrate, potassium chloride, vitamin C, calcium phosphate, ferrous lactate, vitamin E, sodium chloride, zinc sulphate, niacin, calcium-D-pantothenate, copper sulphate, vitamin A, vitamin B1, vitamin B6, manganese sulphate, potassium iodate, folic acid, vitamin K, sodium selenate, vitamin D.